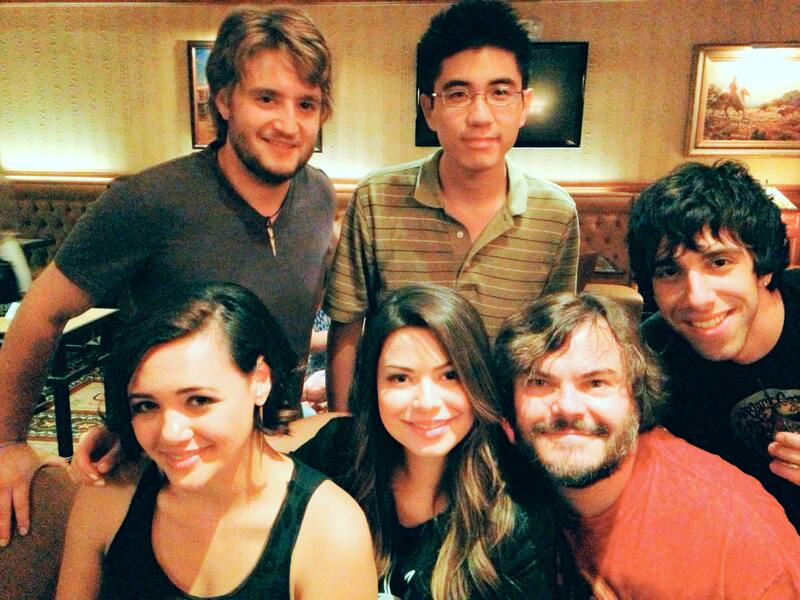 Jack Black reunited with some of the cast members of the 2003 comedy film, “School of Rock”, as you can see in the photo here. It is in celebration of the film’s 10th Anniversary. In this photo are just 5 of the kids from the School of Rock band, not the whole gang. I believe this photo was sent by Miranda Cosgrove who plays Summer in the film (she’s pictured bottom row, center). The kids look pretty much the same, they’re just a bit older now. There have been talks on a sequel for years but Jack said last year, he tried really hard to get Richard Linklater (the director) and Mike White (screenwriter) back together for the sequel but he failed. Jack is dying to make the sequel happen himself but he wouldn’t do it without the film’s original creators. Mike White is the film’s screenwriter and actor who also has a role in the film as Ned Schneebly. I think a sequel would be great ’cause “School of Rock” is actually a wonderful film. It’s one of my favorite comedies. It’s also a pretty realistic movie too. You can actually learn about rock n’ roll from it. “School of Rock” is one of those films, I can watch over and over… never get tired of it. BREAKING NEWS: School of Rock sequel is greenlighted! Richard Linklater is set to direct and Jack Black will play Dewey Finn again!!!!!!! Oh my! This news came to me as a huge surprise! While there were worries that a “School of Rock 2” sequel will never get made, Paramount just gave the film the greenlight to get made. Director Richard Linklater is confirmed to direct the sequel and Jack Black is confirmed to reprise his role as Dewey Finn. Several weeks ago it was reported that screenwriter/actor Mike White sent in a final script for Paramount, the studio must of loved it. The title to the next sequel is “School of Rock 2: America Rocks”. The synopsis for “School of Rock 2: America Rocks” revolves around Dewey Finn and his musical students who own their own music school as left off from the first one, they go on a cross country field trip to learn more about the history of rock n’ roll and explore other genres such as blues, rap, and country. Please make Sarah Silverman and Joan Cusack return again! Since “School of Rock 2” is touring in the next one, I expect a lot of famous rock stars appearing in cameos. Looking forward to the sequel, indeed. Can’t wait! Lets celebrate with the video below! wOOt! 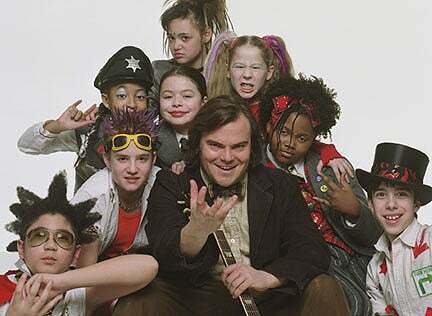 Not too long ago, Jack Black spoke to MTV News that he would love to do a “School of Rock 2” only if Richard Linklater directed it. He even teased that Mike White “might” be the screenwriter again. Turns out that Mike White is writing a script for the sequel. Last Sunday, Mike White the man himself was attending a LAFF panel, and he revealed the news that he “IS” writing the script for the sequel of “School of Rock” but he is refusing to give out the plot. Mike also confirmed that there is a sequel to the film coming. While he is writing the script, he just finished a first draft and already turned it in to see if the film makers like it enough to get it made. At the end of the first School of Rock movie it ends while the credits are rolling, Dewey Finn and Ned Schneebly (played by Mike White) open up their very own music school. My guess will be Dewey Finn’s adventurs with his new music school that he owns continues on from the last one where it left off. In the sequel of “School of Rock”, I hope it won’t be another battle of the bands storyline. It’s time for something new. As long as Richard Linklater is still directing it, the original kids of the School of Rock band, Sarah Silverman and Joan Cusack are still in the sequel, I’ll go see it. I’m sure Mike still has his own character Ned Schneebly in the sequel too. The question is, will Richard Linklater still be on for the sequel? I’m sure he’ll speak out on this soon now the sequel of the film is getting media attention. Report: Will Jack Black do “School of Rock 2”? MTV reported that Jack Black said he’d love to do a “School of Rock” the sequel but he will only do it with the original director Richard Linklater. Meaning if Richard Linklater agrees to do the sequel, Jack is definitely down. There are no plans of making a sequel to “School of Rock 2” but Jack has hinted there is a draft script in the works, no word if original screenwriter Mike White (who also had a role in the film) will return as the writer. Jack Black is the current star of the animated film “Kung Fu Panda” out in theaters now. Bring on the sequel to “School of Rock”!!! I think it deserves one! As long as they have the same cast and crew for the sequel, I’d definitely see it.